According to statistics prepared by aid organisations working in West Papua, the province's overall health status is the lowest in Indonesia and the problems of access to and availability of services will mean that a high proportion of the population will remain under-served. Indonesian Department of Health reports show that in the central highlands, with a population of around 400,000, there is only one hospital with 70 beds, and 15 health centres with a doctor in the 13 subdistricts covering an area of 53,000 square kilometres. There are many remote, outlying villages which have no access to health services, health centres nor clinics. There appears to be a disproportionate emphasis placed on "family planning" rather than on hospital and medical services throughout the province. 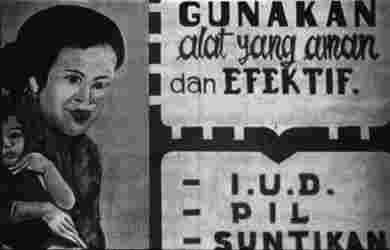 A local Indonesian health worker has stated that in one remote region of 40,000 inhabitants, 100 per cent of females of child-bearing age are acceptors of family planning. (This sub-district has been extensively surveyed by the Freeport mining company, which plans to extend its existing mining operations into this area, and is targetted as a major Transmigration receiving area). Independent studies have been requested by concerned local women and men to monitor the effect on villages of the implementation of family planning, and the long-term effect of the drop in the birth rate. Cases have been reported of bribery of local women into becoming family planning acceptors, and "over-zealousness" amongst local officials involved in the administering of the government's national "two child" program. NGOs have noted the greater degree of family planning targeted at indigenous women over transmigrants. Complaints have been made of incorrectly fitted IUDs and general lack of choice and information about side-effects of the progestogen-only contraceptives, Depo Provera and Norplan implants (the two long-term injectable methods of fertility control), which are the most commonly provided methods. These methods have been identified by the WHO as presenting the highest potential for interaction with HIV infection. 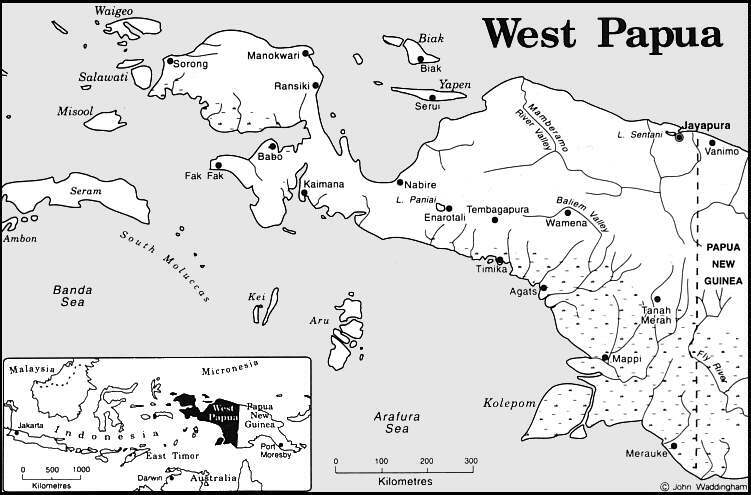 West Papua has the lowest population density in Indonesia, owing to its area, but the central highlands, soon to be connected to the capital by the Trans-Irian highway, is comparatively densely populated by tribal groups. The infant mortality rate in West Papua ranges between 70-200/1000. The maternal mortality is 4.5/1000 in rural districts, where the majority of the population live, compared with a rate of 1.3/1000 in other parts of Indonesia. Pneumonia accounts for 26 per cent of infant death, diarrhoea 19 per cent, and malaria 11 per cent. According to an international church NGO, the major underlying cause is clearly malnutrition with over 20 per cent of the population in the central highlands experiencing some degree of malnutrition. Less than half the children under five are judged to be well nourished. The percentage of immunised children is 40.8, well below the national average of 60.3. West Papua has the lowest life expectancy of all Indonesian provinces, particularly for women, who have a life expectancy of 50.3 years compared to the national average of 62.7. Access to clean water is a problem for 75 per cent of the rural population. Knowledge of and resources for good sanitation are very unevenly spread. Communicable diseases, including tape worm infection, chlamydia and gonorrhea, acute respiratory tract infection and diarrhoea are also significant health problems. In many regions gonorrhoea is widespread, although having only arrived relatively recently. Chlamydia is the major cause of sterilization among local women and this disease has been allowed to spread untreated despite its simple treatment using antibiotics. The birth rate has dropped by 80 per cent in some areas. Other diseases being treated by missionaries in remote areas include ear disease, flu, filariasis and ascaria. Infectious diseases such as tuberculosis and hepatitis are also widespread. Leprosy, despite its eradication around the world, is as high as 88 per 10,000 people in some regions. Low income levels make medical financing very difficult; affordability and availability of medicines, even common antibiotics, is a problem. The supply of cheap, good quality and basic equipment is a constant problem as is the lack of refrigeration equipment, vaccines and sterile vaccination equipment. Specific data on AIDS in West Papua is limited, despite recording the highest number of carriers in Indonesia. This is a recent and frightening phenomenon. The official figures show the number of cases has tripled between 1990-1995. It is believed that transmission is likely to occur following the routes of small trading vessels, introduced by foreign workers, the growth in prostitution, and tourism. Cases have been discovered in the main towns and even in the highlands, including the Freeport mining community, where prostitution has increased in recent years. AIDS transmission may be facilitated by several means: more readily available artificial contraception (other than condoms) has led to more promiscuous behaviour; contamination through unsterile medical equipment (according to WHO this may include the injectable contraception used in the administration of the family planning program); and the problem of weakened immune systems from the general ill health present in the community. Support services for people with AIDS are virtually non-existent. This is another area of pressing concern requiring urgent investigation. "Indigenous peoples have the right to access, without any discrimination, to all medical institutions, health services and medical care."